An age-old adage goes something like "Beauty is as beauty does." 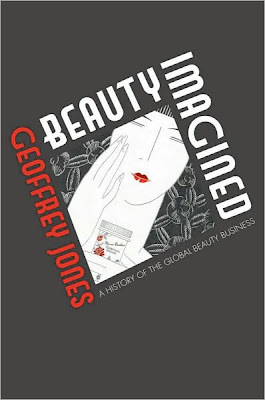 In Beauty Imagined: A History of the Global Beauty Business, author and Harvard business historian Geoffrey Jones examines exactly what beauty did and what it continues to do today. His book is broad and ambitious in scope, examining an industry that has grown from small artisanal firms to a booming business worth billions annually. The beauty industry has been in constant flux since the days when small entrepreneurs sold perfume, soap, and toothpaste. It has been shaped by dynamic entrepreneurs on the make who took risks that paid off or failed miserably, fickle consumer tastes, and socio-economic forces (e.g. feminism, rising affluence among the middle class, globalization, and tribalization). It influences ideals of attractiveness among consumers and is influenced by the beauty standards of consumers in turn. Despite its successes and influence, Jones contends, the beauty business has largely flown under the radar of business and economic historians, which is why this near-comprehensive study is so groundbreaking. If you're looking for a breezy read that provides a general history of the beauty industry, this book is not for you. Sure, the book does a good job of providing the histories of major firms and key figures. However, Jones's prose and the overall tone of the discussions is extremely academic and somewhat challenging. It's interesting if you enjoy that sort of thing. Seeing Jones cite theories from the likes of Joseph Schumpeter, Kenichi Ohmae, and Richard Florida reminded me of the economics and social science courses I took during my undergrad. Learning about the beauty industry through the lens of business history made the subject more engaging on an intellectual level. That being said, as a general interest reader, Jones's economics-speak irritated me more than once. The dullness of the prose--which is peppered with talk of "firms," "markets," and "sales"--sometimes overshadowed the dynamism of the beauty industry. I mean, this is an industry populated with interesting characters and fascinating stories! Jones's discussion was somehow always at arm's length instead of truly capturing the excitement of the industry and why beauty devotees love it so much. At times I even found his tone to be a bit condescending. You can tell he's writing this as a professor and not as a beauty insider. In summary, I would have appreciated a little more Shiseido and a little less Schumpeter in the discussions. If you're looking for an academic, well-researched, high-level history of the beauty industry, this book is for you, but don't expect Beauty Imagined to be anything less than challenging. So super interesting. I read somewhere that most luxury brands make the highest profit from perfume sales. Clothing itself is not very profitable. Cosmetics is where the real money is due to the high mark-ups (about 80% of the manufacturing cost). Nice review! I guess not all books about beauty is interesting. You are right! It is hard to apply dry economic theories on an industry so creative. Anya, I've heard similar things in the past too. If a woman can't afford the handbag or the clothes, she can buy a lipstick or a compact and still "own a piece of the brand." It certainly sounds like an interesting analysis of the industry; shame it didn't have that injection of sparkle. The only book I've read on the subject is The Beauty Myth, and that's a whole different story, of course...! Thanks for your comment on Mrs Bossa Does the Do - I definitely recommend saving up for an NYC Topshop fix! Hope you find some gems! Coolness! Hope you are well! Things are settling down so we can talk again! I got my addy shall we start writing again?! It sounds intriguing, though sounds like something we might have to read and write a paper on for my fashion courses!